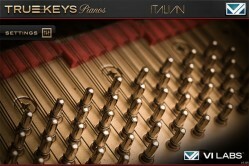 True Keys Italian is the largest piano of this collection and has the brightest sound. Often crowned the World’s best piano, the Fazioli F308© provides the sound for our Italian grand. At a staggering 10 feet 2 inches in length, the instrument has immense power with long sustains and rich harmonics. The Una Corda pedal is particularly expressive letting you go from whisper soft to a thunderous fortissimo instantly, with even voicing across the entire register.